Remember wearing that Superman or Batman costume as a kid for Halloween? You can still live out that superhero fantasy – but now in the form of an action figure with a 3-D replica of your own face. Batman, Batgirl, Superman, The Joker and Wonder Woman. Your price for the Personalized Superhero Action Figure: $127. The company will send you the action figure and the replica of your head, which together stand about 6 ½ inches tall. The kit enables you to remove the original head and attach your own, either temporarily or permanently. You might not want to buy one of these for a child, however, Firebox notes that the action figure is for display only, and even includes its own display base. A new Superman logo has been released in honor of director Zack Snyder’s upcoming reboot of the classic superhero film. The new logo puts a fresh twist on the iconic “S shield,” adding a rounded looked and dark slashes for texture. “I love making genre movies because genre movies have the potential to be the biggest movie. Watchmen is a crash course on the rules of the why of superheroes, so for me now, to go and do Superman it’s like ‘Okay, I got that, I know why,'” he says. Nicolas Cage’s copy of the first Superman comic sold for $2.1 million at auction on Wednesday, breaking the currentworld record of a comic sold at auction (which previously stood at $1.5 million). 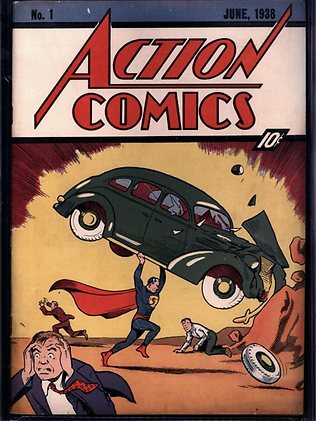 The comic, which was published in 1938 and originally sold for 10 cents, is one of approximately 100 copies of the Action No. 1 comic in existence, of which only a few are in good condition. Cage’s copy sold in nearly-pristine condition. The book was recently assigned a grade of 9.0 by the Certified Guaranty Company, making it the highest graded copy of the comic currently available. The comic was stolen from Cage’s home in 2000 and found in April by a man who bought an abandoned storage locker and found the comic in the storage unit. Is Henry Cavill Is Ripped or What?! Henry Cavill is the new Superman and wow is he ripped! The Count of Monte Cristo actor is taking over the superhero role for Man of Steel and was filming in front of a green screen in Vancouver, Canada when he caught him without his shirt.